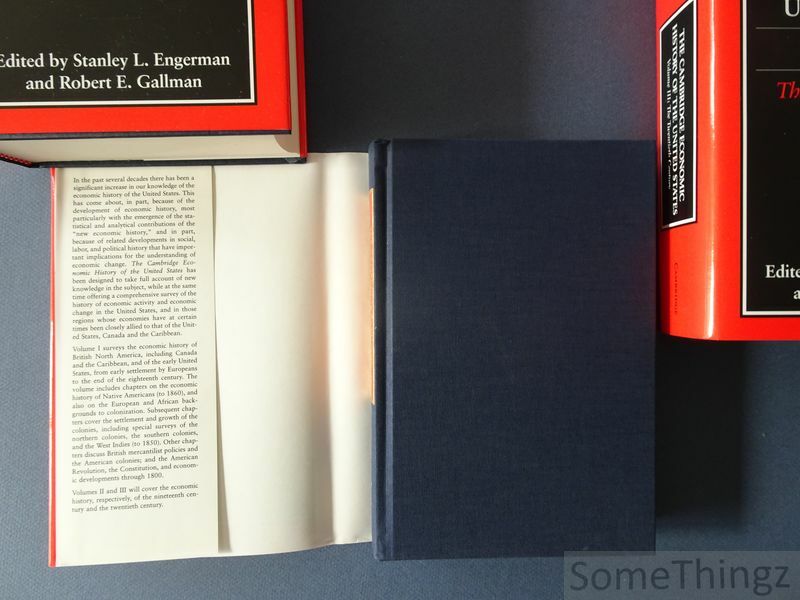 Stanley L. Engerman and Robert E. Gallman (eds.) 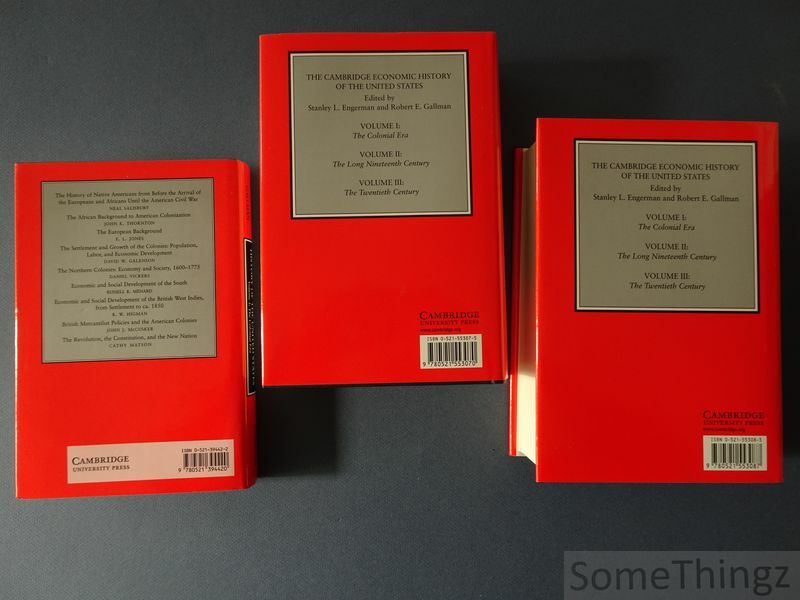 The Cambridge Economic History of the United States (3 vols.) I: The Colonial Era. II: The Long Nineteenth Century. III: The Twentieth Century. Cambridge, University Press, 1996-2000. 3 volume set, complete. Bound, cloth with original dustjackets, 481+1021+1190pp., 16.5x23.5cm., in very good condition. Rare complete set! In the past several decades there has been a significant increase in our knowledge of the economic history of the United States. 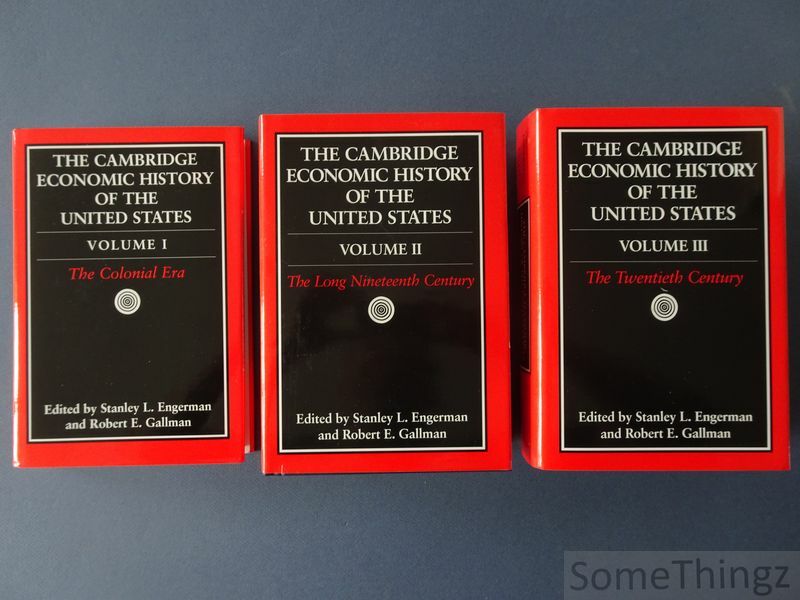 This three-volume History has been designed to take full account of new knowledge in the subject, while at the same time offering a comprehensive survey of the history of economic activity and change in the United States. This first volume surveys the economic history of British North America, including Canada and the Caribbean, and of the early United States, from early settlement by Europeans to the end of the eighteenth century. The book includes chapters on the economic history of Native Americans (to 1860), and also on the European and African backgrounds to colonization. Subsequent chapters cover the settlement and growth of the colonies, including special surveys of the northern colonies, the southern colonies, and the West Indies (to 1850). Other chapters discuss British mercantilist policies and the American colonies; and the American Revolution, the constitution, and economic developments through 1800. Volume II surveys the economic history of the United States, Canada, and the Caribbean during the nineteenth century, a period of massive international and intercontinental movements of labor, capital, and commodities. The United States and Canada began the period as small but vigorous societies; the United States ended the period as the world's premier economic power. Five main themes frame the economic changes described in the volume: the migration of labor and capital from Europe, Asia, and Africa to the Americas; westward expansion; slavery and its aftermath; the process of industrialization; and the social consequences of economic growth that led to fundamental changes in the role of government. Other topics include: inequality, population, labor, agriculture, entrepreneurship, transportation, banking and finance, business law, and international trade. 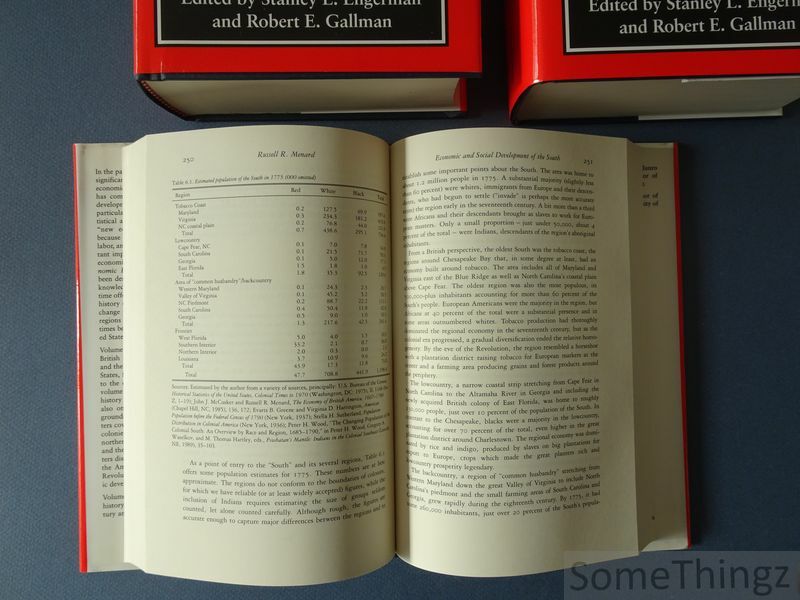 Volume III surveys the economic history of the United States, Canada, and the Caribbean during the twentieth century. Its chapters trace the century's major events, notably the Great Depression and the two world wars, as well as its long-term trends, such as changing technology, the rise of the corporate economy, and the development of labor law. The book also discusses agriculture, population, labor markets, and urban and regional structural changes. Other chapters examine inequality and poverty, trade and foreign relations, government regulation and the public sector, and banking and finance.